Since 1981, we have been counseling lawyers and other professionals on how to grow their business. We can help you and your organization improve your bottom line in a variety of ways. Here are just a few examples of some of the engagements and results brought to clients. For a mid size law firm, we designed and implemented a client development plan consisting of a new organizational structure to maximize personalized delivery of legal services to its clients. We involved attorneys and staff to formulate a culture that uses the client as its center on all decisions, bringing higher levels of involvement, trust and value to the client, increasing profits by 36%. For a small law firm we helped reactivate past clients, adding 43% annual revenue growth and lowered advertising costs by 58%. For a financial planning advisor, we helped write a Special Report adding an additional revenue stream, as well as an effective lead generation piece. For a personal injury firm we designed and implemented a referral program soliciting and obtaining referrals from other attorneys. For an associate seeking partnership in a commercial law firm, we designed a personal marketing program leading to a 35% increase in her book of business. For a commercial law firm, served as outsourced client officer meeting with key clients to insure open and frank feedback on delivery of services, using the feedback to further raise service levels. For a finance company, we provided a strategy formulation process enabling the organization to allocate priorities and resources based upon a comprehensive client value added business concept. One of the results was increased focus by helping the Executives concentrate on the organization's strengths and value to its client base resulting in dramatic growth. For a non-profit organization, led a top down fund development and marketing program leading to 67% year over year increase in contributions. For a bank service corporation, led a top-down review and designed a comprehensive people management strategy which focused on client needs and impressions, talent retention, and attainment of high-priority business goals. This resulted in the creation of a team of middle managers who felt more responsible and accountable for business outcomes, creating a direct link between all employees and bottom-line business results. "I sat down with Cole confused and frustrated with where I was currently at with my profession. After going through three years of law school and paying what amounts to a small mortgage for that education I found myself trapped on a career path. A person whose advice I respect tremendously suggested that I talk with Cole since he specializes in career and marketing development for lawyers. I figured at this point it couldn’t hurt. 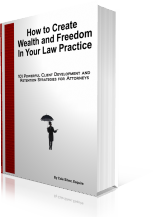 Cole listened attentively to my interests both professionally and personally and with his expertise crafted a brain storming session in which he came up with numerous ideas both inside and outside the legal profession. I learned numerous things and got tons of advice which will help me change my career path, and in essence better my life. However after everything I learned and experienced, two things stand out the most. I now have clarity and direction. I now realize what types of things I would enjoy doing with my legal education and I now have a direction on how to get there and make my goals a reality."